Luz Rivas is Founder and Executive Director of DIY Girls. Ms. Rivas has experience in engineering, STEM curriculum development, program management, and educational research. Luz started her career as an electrical design engineer for Motorola. She has worked in informal science and engineering education for the last 10 years. She enjoys working on creative electronics projects and wants to get better at woodworking. Luz has a Bachelor of Science in Electrical Engineering from MIT and a Master’s in Technology in Education from the Harvard Graduate School of Education. I first got interested in engineering and technology 30 years ago when I was in 5th grade. My class had four Apple IIe computers, and my teacher taught us to program in Logo and BASIC. This was my first time using technology to create something and I loved it. In 6th grade, my teacher continued teaching me to program and took some of us to what would now be called a hackathon for kids at our local university. When I entered middle school, I chose to take computer programming again since it was something I was already familiar with and I didn’t want to take cooking. These experiences sparked an interest in me to pursue a technology career, and after high school I was on my way to MIT to study electrical engineering. Unfortunately, my story is not so common for girls from Pacoima, a high-poverty, majority-Latino community in the Northeast San Fernando Valley of Los Angeles. While most focus on stats that label my community as disadvantaged and underserved, we do have an advantage when it comes to making. Pacoima is a community of makers. Growing up, I saw both men and women making things like their own furniture from scrap wood, toys for their kids, elaborate dresses for quinceañeras, and hacking and fixing electronic household devices. After working as a hardware engineer, attending grad school at Harvard, and working in science and engineering education for 10 years, I decided to go back to my community last year and start a program for girls. I wanted to make explicit for girls the connection between making in their community and making with more advanced technology. To do this, I launched the DIY Girls after-school program for 5th grade girls at my former elementary school. The school offered me a dedicated classroom space, which ended up being my own 5th grade classroom! With help from volunteers, friends, and teachers, I converted the classroom into a makerspace, recruited our first cohort of participants, and was ready to get started. The DIY Girls program is designed to offer experiences that will attract young girls to technology, allow them to express themselves creativity, and give them more confidence in their technical abilities. We aim to have an effect on the girls as they enter adolescence and start to form career interests. We meet with 30 girls twice a week for two hours each session throughout the school year. Through hands-on making activities, girls in our program make real things like their own toys, wearable electronics, and video games. They learn technical skills including soldering, computer programming, basic electronics, and power tool usage. They then apply these skills creatively by designing their own projects and inventions. Creative Electronics: Girls learn electronics though e-textiles and other creative materials like conductive paint. The goal is for girls to be creative while learning basic electronics. 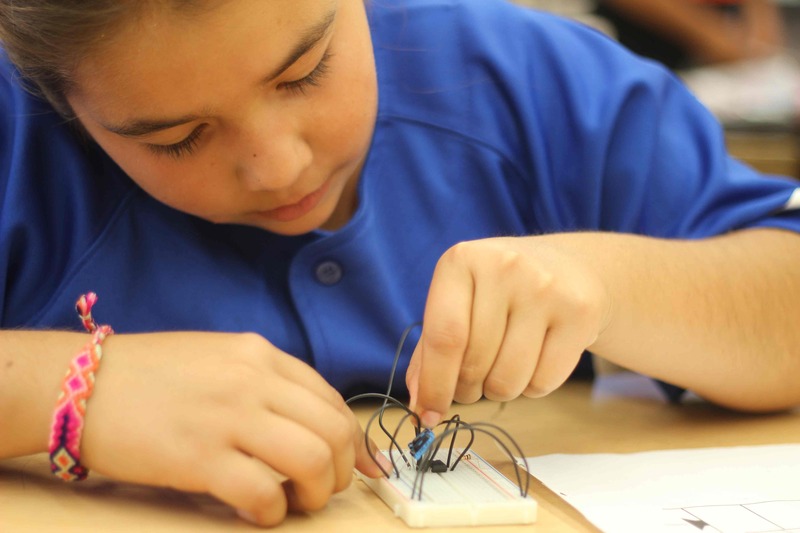 They also learn to solder, strip wire, build circuits on breadboards, and use multimeters. 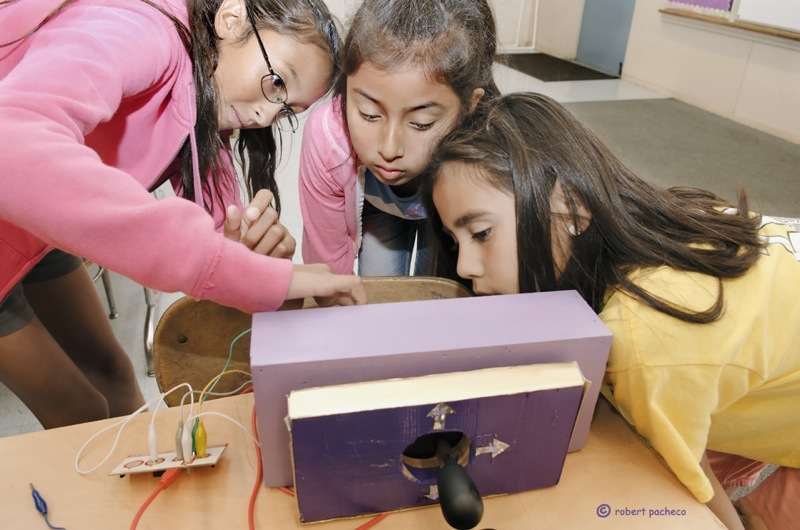 Building and Tinkering: We teach girls to use tools needed to build things. Girls take things apart and learn appropriate ways to use the tools in addition to safety techniques. We aim to instill confidence through this session. Product Design: Girls combine the skills developed throughout the year to design and create their own products. Girls use a 3D printer, MakeyMakey boards, and other materials to create a product. We culminate with a public showcase of the products for families and the community. DIY Girls has been successful in creating a learning environment where girls can take risks, build confidence, and work on projects that attract them to technology. If a girl gets frustrated one day because her program or project didn’t work, she knows she will have the opportunity to try again when she returns to our space for the next session. Girls love that they’re learning real skills, and teachers and administrators have told us that they notice an increase in self-confidence in them. We’re excited that the majority of girls want to continue working on making projects in middle school. Unfortunately, their middle schools are offering them technology classes where they learn to open and close windows and type documents. This is devastating for us and the reason we want to continue offering programs for our girls beyond 5th grade. We dream of teaching our girls more advanced skills like programming and creating projects with Arduino and Lilypad Arduino. In addition to our vision of creating continuity for our girls, we want to expand to new schools. Word of mouth about our program has spread in the community and we get calls from schools that want us to offer the program at their school. This interest and demand inspired us to launch an Indiegogo campaign to raise funds so that we can expand our program and reach more girls! I invite you to learn more about our program, consider supporting us, and send us ideas on new projects for our girls. Editor’s Note: We met Luz at World Maker Faire New York 2013, where she had travelled across the country to spread the word. Her passion and enthusiasm are contagious and we applaud Luz on her efforts!